Very nice quality! Good price! Would highly recommend ! A modern take on the timeless Greek key motif, the Carly Pillow provides texture and dimension to any décor. Metallic embroidery adorns the soft and luxurious fabric, creating a chic and cozy pillow. Handcrafted to perfection, the pillow showcases artisanal skills and promises plush comfort for any home. Beautiful pillows! Great quality and the detail on the embroidery is nice. 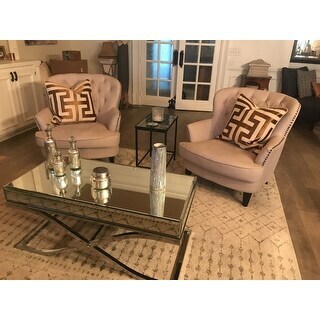 A tad bigger than expected, but they work beautiful on my sectional, together with my other accent pillows. This are luxurious pillows, with a beautiful finish. Great buy at a great price! OK these are Beautiful!! I love them. I got the copper color. The ivory to me looks a little more beige. That didn’t bother me at all. Love so much that I may order more. Stunning pillows! Inserts included. Corded and very luxe. Beautiful! We've bought two different colors of these pillows. What's great is that they come with the down fillers. They are very good quality and heavy duty. We work for a real estate company that stages and we have used these in the bedroom as well as in the living room. I definitely recommend them...I'm sure we will buy more in the future! Beautiful pillow. Size is great. This is my third purchase of this series of pillows. The gold is true gold. It does not feel coarse or cheap at all. Beautiful pillow. Bigger than expected and case came seperate from the pillow. But put together it is stunning & looks very “high end.” May purchase more. 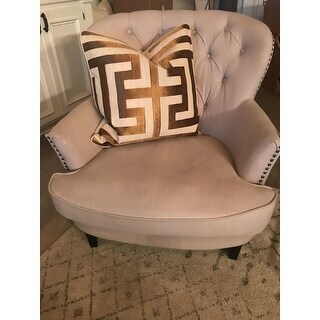 I love this throw pillow - it was filled perfectly and it is so pretty with my furniture. It is also comfortable. I am an Overstock associate and was given this product to test and leave an honest review.